Dayton, Nevada, area residents who are experiencing chronic shoulder pain can rely on the experts at Tahoe Fracture & Orthopedic Medical Clinic for all of their treatment needs. We’re proud to be a full-service practice, meaning that our team can diagnose your condition, prescribe conservative treatment methods, perform shoulder replacement surgery (if needed), and walk you through postsurgical rehabilitation. We believe that offering a full spectrum of care saves our patients the time and hassle of having to visit multiple locations and consult with numerous providers during what can already be a very stressful time. In some instances, however, conservative treatment is not enough. If that’s the case for you, our team includes surgeons who can perform shoulder replacement surgery with skill and precision. 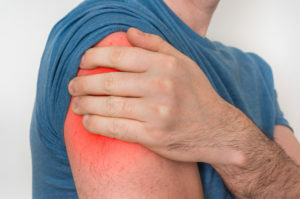 We also offer reverse shoulder replacements to patients who are ineligible for the traditional procedure, whether due to an irreparable torn rotator cuff, cuff tear arthropathy, or some other reason. And, if you do require surgery, we have in-house physical and occupational therapists who can assist you with postsurgical rehabilitation. If you’re in the Dayton, NV, area and you think you might require shoulder replacement surgery, please contact Tahoe Fracture & Orthopedic Medical Clinic today.